Zanzibar is an archipelago made up of Unguja (informally known as Zanzibar), Pemba Islands and about 51 surrounding small islets. 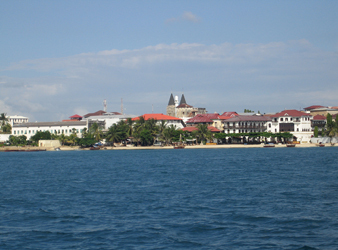 Zanzibar is a semi-autonomous part of the United Republic of Tanzania. It is located in the Indian Ocean, about 25 miles (30 km) from the Tanzanian coast, and 6° south of the equator. The name is a combination of two Arabic words, "Zenj" = black and "barr" = land, resulting in the title "Land of the Blacks". Pemba is named Al-khudra = "The Green Island". Over centuries different cultures have influenced Zanzibar, e.g. Sumerians, Assyrians, Egyptians, Phoenicians, Indians, Chinese, Persians, Portuguese, Omani, Arabs and British have settled here and influenced the local culture. The Swahili are the inhabitants of the coastal regions of East Africa, they have language, Islamic faith and urban culture in common. The name exists since the 19th century, before they called themselves Arabs or Omani. Their existence is documented from the 1st Century. In ancient time they were using typical dhows (wooden boats) for trading with Indians and Europeans. 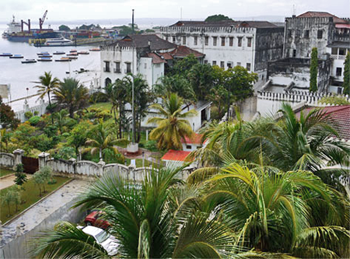 Zanzibar grew rich on its clove trade, but also notorious as a hub for the slave trade. The language Swahili comes from the arabic "sãhil" = coast, it is a Bantu language and the most widely used language in East Africa, it is spoken by over 80 million people. 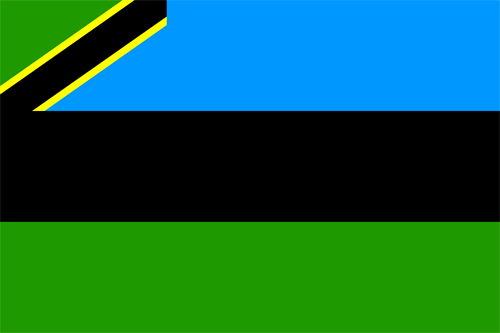 Swahili is the official language in Tanzania and Zanzibar. To most people single words of Swahili are well-known from film and television. E.g. "hakuna matata" literally means "no problems", "safari" means journey, "daktari" is the doctor, "simba" the lion and "jambo" is used for saying "hello". On Zanzibar a typical style of music developed from a combination of African, Arab and Indian elements; it is called Taarab music. The emergence of this particular style of music in Zanzibar is attributed to the influence of Sultan Bargash at the end of the 19th century. Currently the most popular Taarab Orchestra is the Culture Musical Club. Once a year in February the music festival Sauti za Busara takes place in Stone Town with music groups from all over Africa.